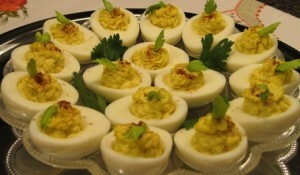 If you like deviled eggs, you will agree that every cook has his/her own special touch in making them. The main recipe is basically always the same, but everyone adds something extra to make it their own. This particular recipe was created by me personally, and the men in our family enjoy these Deviled Eggs very much. Place the raw eggs in a large pot filled with cold water, about an inch above the eggs. Cover the pot, bring to boil, and cook for 10 minutes. Remove from heat, and drain the water. Crack each egg shells with a spoon, and cover with cold water until eggs cool off (this helps the peel to come off with ease). Peel the eggs, and rinse off (in case there are any remaining shell pieces). Cut eggs in half, lengthwise. Scoop out the yolks into a bowl, and lay the hauled out egg white halves on a serving platter. Press the yolks through a sieve, by using a spoon in a sweeping motion. Fill a cake decorating bag fitted with your favorite tip, with the yolk mixture. Fill the hauled out egg whites halves. Decorate with Parsley, Celery, or Dill leaves (optional). Any leftover Deviled Eggs are a wonderful snack the next day, or served for breakfast. These deviled eggs look beautiful! I’m always on the lookout for new (and easy) finger food recipes, as I entertain frequently. An added bonus is that my husband loves deviled eggs. I can’t wait to add this recipe to my party “arsenal”. Thank you for the compliment. I am still experimenting with food photography…..it’s not easy. If you prefer creamier filling, don’t be afraid to add a little more mayo….I was trying to keep it on the healthy side, thus as little mayo as possible.